Meet alien crabs and make them bleed. My heavy gunner has a jetpack? Cool. My first inclination is to direct him to the rooftop of a nearby tower to rain fiery death down on the crab-like invaders swarming the map, but Phoenix Point chief designer Julian Gollop hints that that might not be wise. A few turns later the tower is destroyed completely by a rampaging spider monster. The creature is the size of a house and barges through terrain like a drunk kicking their way through a flower bed. It’s clear that its massive claws will make short work of my soldiers should it get close. I discover that I can target many different points on the creature, blowing off legs to slow it down, or shooting its claws to hopefully blunt its melee attack. Explosives are particularly useful against such a massive beast because the blast radius can damage multiple limbs. In the end, this is how I cripple it, with shoulder-mounted rocket shots from my heavy gunner, and some grenades from my assault soldiers. The queen dies just a few movement points away from my soldiers as they huddle in a defensive formation in the corner of the map. The sheer size of the thing presents a daunting challenge, and this is the first of many ways that Phoenix Point differentiates itself from Firaxis’ XCOM reboots. 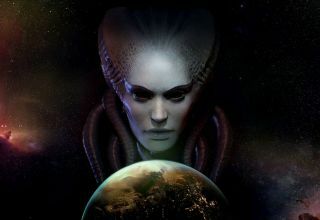 Though Julian Gollop created X-Com, the modern Firaxis games are an inevitable comparison point given Phoenix Point’s surface-level similarities in format and UI. At a glance the sight of your troops’ taskbar of actions and the territory outlines showing how far your troops can move are very similar to XCOM and XCOM 2. However, the Firaxis games didn’t feature location-based damage. They didn’t model impact chance of individual bullets. They didn’t stop the action the moment your soldier spotted an enemy, giving you the chance to duck back behind cover. Their boss monsters weren’t this huge. Cumulatively, these changes make Phoenix Point feel like more of a detailed combat simulation. The all-or-nothing percentage chance shots of Firaxis XCOM could be cruel, and flanking—the most effective way of tilting those dice rolls in your favour—was hugely important. In this demo the high hit frequency and wider range of attack outcomes created a more detailed, shifting battle state. Phoenix Point is more nuanced. In typical XCOM fashion you command your team by moving them around the gridded battle map, seeking out cover and getting flanking lines on enemy combatants. In the combat demo I played at the PC Gamer Weekender my soldiers specialised in multiple classes including the aforementioned jetpacking heavy gunner, assault troops who get free reaction shots when attacked, and a slow sniper who shoots dudes really far away. The UI displays several layers of info about each potential shot. There’s a percentage chance to hit (which generally seems far higher than XCOM), a percentage chance of a kill, and percentage chances attached to enemy limbs so you know how tricky it will be to cripple a body part. In addition to breaking limbs you have a chance of inflicting bleeding damage. You also need to consider the different types of damage your soldiers do when confronted by specialist crab men. Close combat shield-arm guys can choose to present the shield in any direction to protect their advance. Heavier weapons have a chance to penetrate armour, so your sniper and your heavy gunner can try to shoot through the crab’s shield in the hope of disabling the shield arm and inflicting some bleeding damage. The dice rolls could yet change a lot during development, but in this demo the high hit frequency and wider range of attack outcomes created a more detailed, shifting battle state. One gun-arm crab was causing me trouble, but a reaction shot from one of my assault soldiers did a little damage and inflicted bleeding. I could choose to leave him to bleed to a low health state and chance a future reaction shot taking him out. Alternatively the reaction shot could have shattered the crab's gun arm, effectively taking it out of the fight without killing it. In XCOM enemies were as effective on one pip of health as on max health, in Phoenix Point battle damage creates a more authentic sense of evolving combat. The UI has changed in the latest build, but you get a similar amount of information about potential shot outcomes. Soldiers have a new resource to manage called Willpower. You can use a Willpower points to perform stressful extra actions. You spend Willpower to put a character into Overwatch—a stance that grants your soldier reactive shots in the enemy’s movement phase. Assault characters can use Willpower to make an extra move after shooting. If they are faced with a shield crab they can move into a flank, fire, then use Willpower to skid back to cover. It gives you the opportunity to spend and commit to an extraordinary action that might get a soldier out of trouble, or eliminate a key enemy. There's a lot more still to see of Phoenix Point. The world map will feature several human factions in addition to the crab aliens, and Gollop hints at Lovecraftian inspirations for the enemies in Phoenix Point. So far I like the gritty tone of the environmental design, and I like the granular approach to combat simulation, which gives you more factors to consider than Firaxis' XCOM. Based on my short time with it, Phoenix Point could end up being the deeper game, and a worthwhile alternative to Firaxis' reboots.